Product prices and availability are accurate as of 2019-04-19 23:45:06 EDT and are subject to change. Any price and availability information displayed on http://www.amazon.com/ at the time of purchase will apply to the purchase of this product. RF-1430-580-GH. New Low-Cost Flow Meter/Regulator Kit for Argon & Argon/Co2 Mixes. High-quality design with premium brass body, robust pressure gauge and easy to read flow tube. Specifications: Gases Used: Argon Flow Range: 10-60 SCFH Preset Delivery Pressure: 30 PSIG Inlet Connection: CGA 580 Easy to Read Durable Flow Tube with Sight Ball Brass Body. 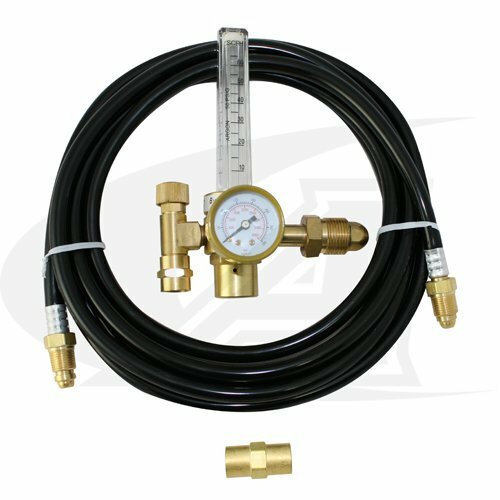 Gas Hose Kit Includes: Flow Meter/Regulator 12.5' (3.8m) Gas Hose Hose Coupler.